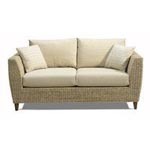 Not only are our Rattan Sofa sets much more comfortable than last year’s models, but we also have other colours to pick and choose from. 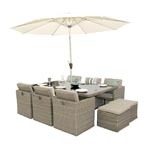 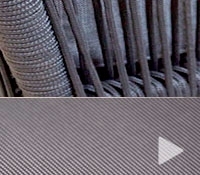 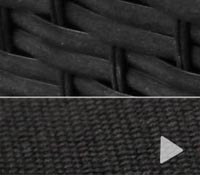 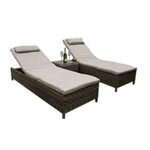 Last year we saw that the Black Rattan Furniture paired with Black cushions made for an extremely popular combination. 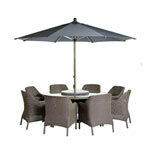 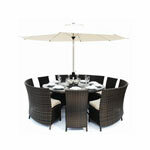 This year we will have more of our popular Rattan Furniture sets available in this Black colour combination. 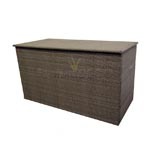 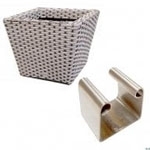 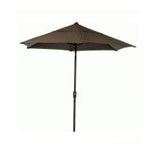 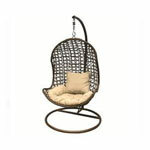 We also have a new colour coming into stock which we call the Natural Rattan. 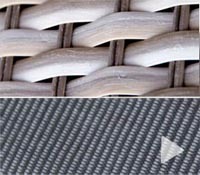 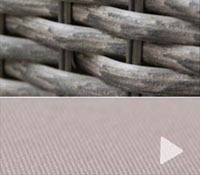 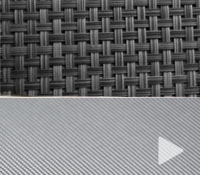 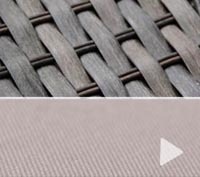 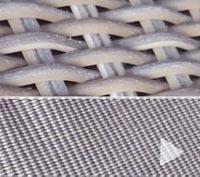 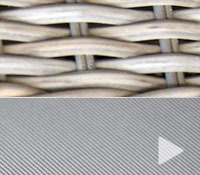 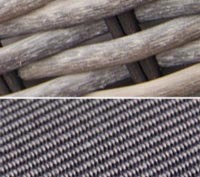 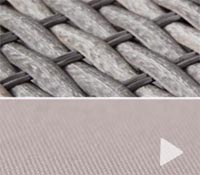 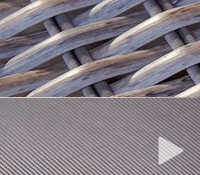 Our Natural Rattan Colour allows for more of a dynamic colour combination for you to use. 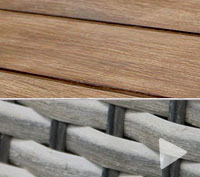 The natural colour gives a neutral feeling which in turn will make the Garden Furniture Set fit in its surrounding and not look out of place. 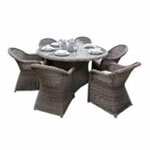 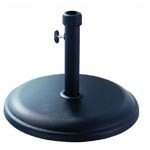 It will look like it belongs there and has been a part of your garden for years. 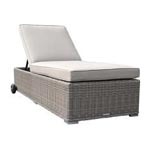 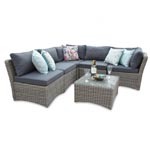 We offer several different types of Rattan Sofa Sets that include your Classic Rattan Sofa set that consists of a sofa, two chairs and a coffee table. 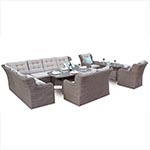 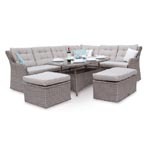 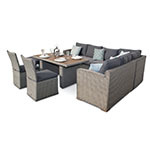 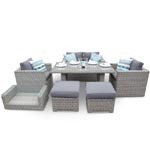 We then have your Modular Rattan Sofa Set that consists between five to eight units (Corner Chairs/Armless Chairs/ Arm Chairs/Coffee Tables/Footstool). 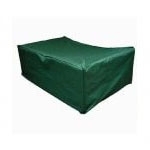 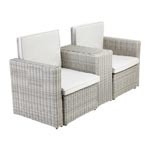 We then have your Rattan Corner Sofa Sets which has the footprint of the Modular Rattan Sofa Set but it is more of a fixed seating position which is usually in an “L Shape” configuration. 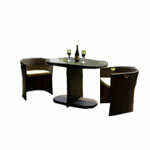 The Corner Sofa Set also has a rounded corner unit rather than a square corner unit. 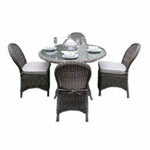 This allows for more seating positions and also makes it much more comfortable. 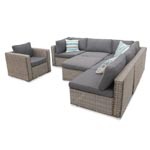 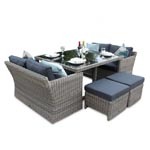 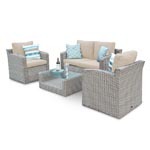 Check out our full range of Rattan Sofa Sets that will spark some new life into your garden.